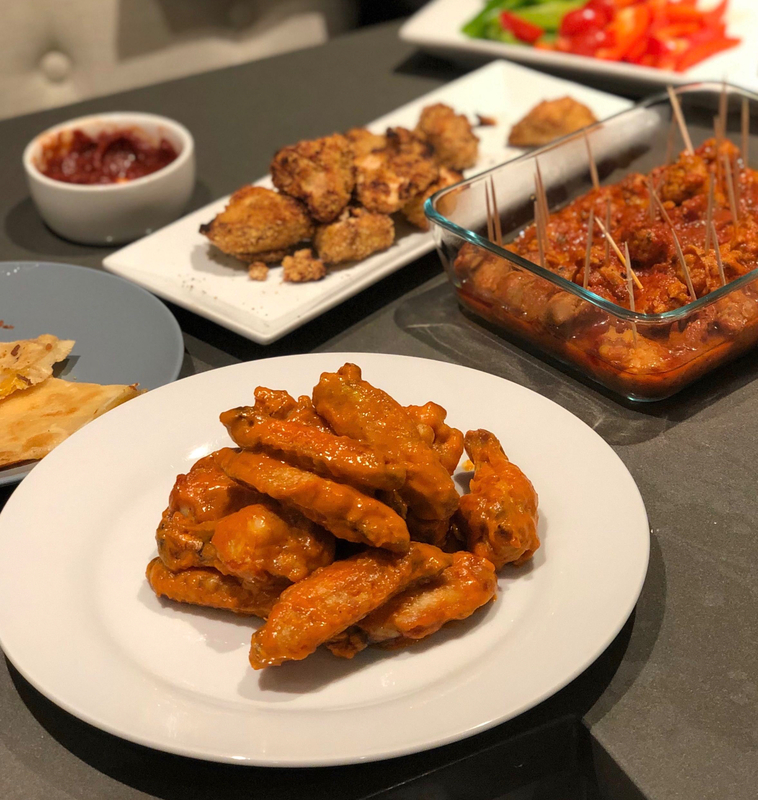 Planning a Super Bowl Party for Your Office?! FoodtoEat’s Tips and Tricks to Score Major Points! GAH! You just got asked to plan a Super Bowl party for your office to celebrate game day and you have no clue how to get started. Sound familiar? We’re here to help. Having facilitated book launches, company-wide holiday parties, in-office carnivals and Game of Thrones-themed happy hours…. we’ve picked up some rules of thumb for party planning. Below are some of our go-to tricks for making sure that your team is well-fed and hydrated for the big game! For a lot of people, it’s hard to carve out too much extra time to spend at the office if an event isn’t taking place during the workday or directly after work. Your colleagues may have other priorities outside of work that they need to focus on, which, sadly, may not include getting drunk and discussing (or watching) the Super Bowl with you. But that’s OKAY! If you’re planning to convene at your office on Super Bowl Sunday to watch the game together, the time frame will be much longer, about 4-5 hours, since you’ll be watching the game and, of course, the halftime show! But if you’re planning to celebrate kick off earlier in the week with your office (Super Bowl trivia, Super Bowl bingo), 2 hours is usually a good amount of time for people to mingle, play games, eat some appetizers and have a few drinks before heading home. Also, it’s usually best to plan your start time between 3PM and 5PM. Late afternoon is when your co-workers will generally start looking for an afternoon snack and people will be excited to end their workday a little earlier than usual- an added perk! Now if your colleagues are big drinkers, you can always increase from here. However, we’ve found that generally, most employees like to have about 2-4 drinks during a work event. Even if you’re celebrating something non-work related, such as the Super Bowl, a lot of employees usually put a cap on the number of drinks they’ll have in front of their boss. For most happy hours we recommend sticking with beer and wine as the drink options for four reasons: you don’t have to try and figure out how many bottles of liquor vs. bottles of mixers you’ll need (if you don’t have any bartending background, it’s tough); you don’t have to worry about anyone in the office over-serving themselves (it happens); if you aren’t familiar with your building’s policies, free pouring liquor could become an insurance issue; and beer and wine are generally more cost-effective options where you’ll get more bang for your buck. Once you’ve solidified your drink choices, the next step is portioning the correct amount of beer and wine needed for your team. When breaking it down, we usually split the beer drinkers vs. the wine drinkers right now the middle (unless we know there’s a drink preference in the office). So if you’re an office of 30 people, it will be 15 beer drinkers and 15 wine drinkers. Based on the 2 drinks per person per hour rule, each person will have 4 drinks total, which means you will need to buy five 12-packs of beer and 15 bottles of wine. If you know that most of your office leans toward drinking beer or drinking wine, you can always adjust that headcount breakdown. However, if you’re really not sure of preference, it’s a safe bet to split it down the middle. At the end of the day, if someone wants another drink that isn’t their preferred choice, they’ll make the switch. Similar to the drinks, the food really depends on how heavy your team eats. If you know your coworkers like to go back for seconds and thirds, you may want to increase to 5-6 bites per person per hour. And for an event like the Super Bowl, going heavier can’t hurt since football = all of the foods. However, we’ve found that 3-4 bites per person per hour is sufficient for a late afternoon snack/happy hour. That’s why event start time is key here. Starting the event between 3PM and 5PM implies that you will only be providing a snack for team members, not dinner. If you start the party too late, people will arrive hungry and ready to eat a meal, which will wipe you out of food. As opposed to a late afternoon event, which sets the expectation that it will be bites, not a buffet. Also, when reviewing the food choices for your Super Bowl menu, a good thing to keep in mind is that you want to supply “socializing food”, aka food that you can hold in your hands while talking to others. So try to stick with menu items that your colleagues can hold in a napkin rather than food that requires a fork and knife. In regards to the amount of appetizers that you’ll need to order for your office, that depends on how many bites you want to provide per person during the event. If you’re going based off of our recommendation, using the 30 person office example again, you’ll need to order about 16-18 dozen appetizers. However, if you have a budget set for the amount of money that you can spend on food and it won’t cover that large of a range of food, you can always lower the amount of bites per person, include dips (these tend to stretch farther than individual pieces) or opt towards the less expensive menu items, such as pigs in a blanket, quesadillas, etc. And if you’re interested in being in the office MVP rather than the office party planner, we have you covered there as well! Reach out to letseat@foodtoeat.com today to place an order for one of our Super Bowl specials and make sure that your office party is a real touchdown!